Hemp is now an amazing bonafide superfood: “Hemp is super-nutritious and although tiny, quite mighty,” says Amy Shapiro, R.D., founder of Real Nutrition. To reap the benefits, Shapiro suggests adding one daily tablespoon of hempseed—also known as hemp hearts—to your diet in a variety of ways. Mix them into to your smoothie or bowl of oatmeal for breakfast. And at dinner or lunch, sprinkle them on top of your salad, grain bowl, or plate of pasta. You can also try hemp milk—a non-dairy option made from blending hemp hearts with water. And there’s hemp oil, which Shapiro says may (bonus!) help prevent eczema flareups. Meanwhile, hemp butter—ground-up hemp hearts—makes a healthy peanut butter substitute. “There are really no negative side effects [to consuming hemp] except if you take blood coagulants, you should increase your hemp intake slowly as it may cause bleeding risks,” says Shapiro. And yes, hemp does come from the same family of plants as marijuana. But no, it won’t get you high—there’s a distinct difference between psychoactive and non-psychoactive forms of hemp, according to the journal Nutrition and Metabolism. In fact, hemp seeds contains less than 0.3 percent tetrahydrocannabinol (THC)—which is super minimal. So no, the hemp seeds in your cereal won’t make you laugh at Pineapple Express, but they might help you enjoy a healthier life in the following ways. 1. Hemp seeds can help build muscle mass. Skip the protein powders and add a dose of protein-rich hemp to your smoothie to change things up. Shapiro says that unlike most plant-based protein sources, hemp seeds contain all the essential amino acids, making it a complete protein. Three tablespoons provides 10 grams of protein—the same amount as a Go Macro protein baror three ounces of cottage cheese. Hemp seeds contain a small amount of complex carbohydrates (about a gram per tablespoon), which releases glucose slowly into the bloodstream, according to The American Heart Association, and prevents that dreaded energy spike and subsequent crash. 3. They help you lose weight. Weight loss occurs when you expend more calories than you take in, so hemp seeds won’t singlehandedly help you shed pounds. But they might help “if it replaces fattier and richer types of proteins in the diet,” such as red meat or whole-fat dairy, says Shapiro. She adds that consuming it in other forms may also help with weight loss. For example, hemp milk has fewer carbohydrates and sugars than regular dairy milk, and hemp protein powder is a great addition to smoothies to help control appetite. 4. Hemp seeds keeps you from feeling hungry. According to Shapiro, hemp seeds are packed with fiber, which is great for keeping you nice and full for hours. So adding hemp powder, hearts, or milk to your a.m. meal may be the key to keeping that mid-morning hanger at bay. Just be sure to drink plenty of water to help keep that fiber from hanging out in your GI track. Hemp is very high in magnesium, which is a mineral that naturally calms the body and relaxes muscles, says Shapiro. To promote good quality sleep, she recommends consuming a serving a few hours prior to bed. 6. They help correct anemia. Anemia occurs when you don’t get enough iron, and the side effects are not pretty (think: lethargy, chest pain and dizziness, according to theNational Heart, Lung and Blood Institute). 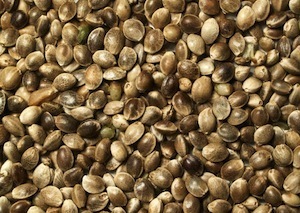 Shapiro says that due to its high iron content, eating hemp seeds is a great way to counteract or prevent the condition. 7. Hemp seeds protect your ticker. Eating hemp seeds “helps prevent heart disease, keep arteries open and decrease blood pressure,” says Shapiro, thanks to an ample amount of omega-3 and omega-6 fatty acids. The seeds also contain high amounts of arginine, which turns into nitric oxide in the body—which is necessary for optimal heart health. Cramping and cravings and mood swings…ugh. The good news: All those essential fatty acids (EFA) in hemp seeds may help all your PMS woes. Research from the journal Reproductive Health found that women who consumed two grams of EFAs daily over a six month period experienced a reduction in pre-menstrual syndrome symptoms. FYI: You can get the same amount of EFAs in a single serving of hemp oil or hemp seeds.